I’ve recently become obsessed with this Harvest Apple Salad. It’s light and fresh and perfect paired with a cup of soup or a half sandwich for a filling lunch. It’s also a great starter or side salad for dinner. You can basically eat it any time, and all the time and if you’re like me, you’ll want to once you try it! 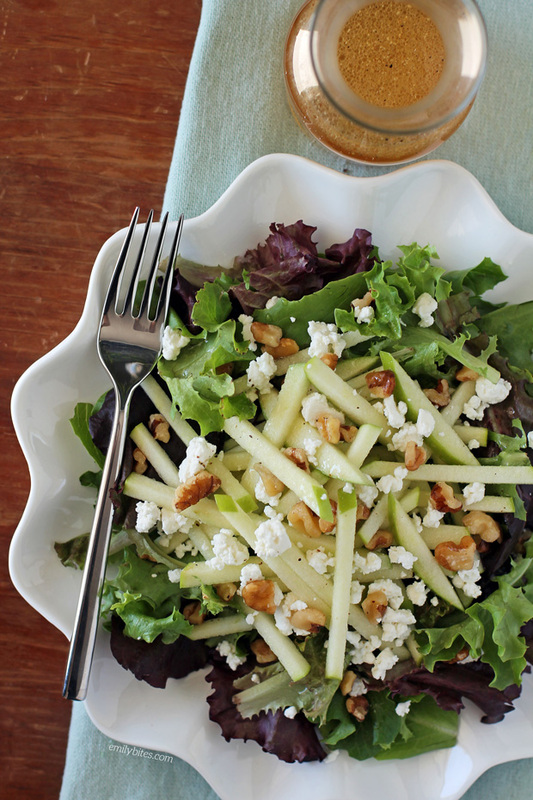 It’s full of beautiful flavors that complement one another perfectly: fresh leafy greens, crisp, tart Granny Smith apples, rich, creamy goat cheese, earthy walnuts and a light apple vinaigrette that’s mildly tart and sweet. Now that apple season is upon us, this is a great and healthy way to get your fix for just 136 calories or 5 Weight Watchers SmartPoints per serving. For more tasty lightened up apple recipes, check out my Mini Cinnamon Apple Tarts, Cheddar Apple Bacon Grilled Cheese, Slow Cooker Applesauce, Apple Cinnamon Baked Oatmeal Singles, Stuffed Acorn Squash, Apple Cinnamon Sangria, Slow Cooker Apple Bacon BBQ Chicken and more in the Apple section of my recipe index! In a mixing bowl, stir together the apple juice, vinegar, honey, salt and pepper until well combined. Add the oil and stir in. 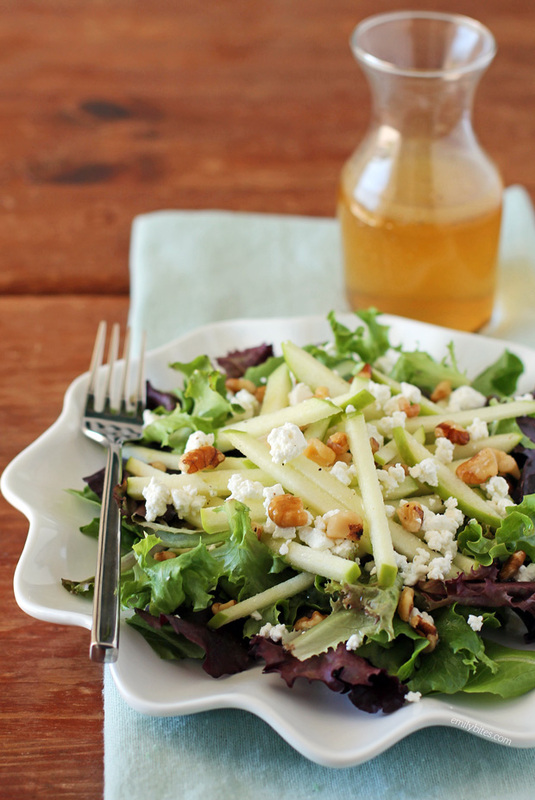 To build the salads, place 1 ½ cups (lightly packed) of greens onto each plate and top with ¼ of the apple slices. Sprinkle ½ an ounce of goat cheese and a tablespoon of walnuts over each plate. Make sure to stir or shake the dressing again before adding it to combine ingredients. Drizzle two tablespoons of the dressing over each salad. *Build each salad to serve! If you’re only serving one or two salads, store the remaining dressing in an airtight container in the fridge and toss the leftover apple slices in lemon juice (also store in the fridge). You don’t want to build the leftover salads and dress them until you’re ready to eat them. How did you make your apple in matchsticks? Did you use a certain tool? Nope, just cut them up into thin strips with a paring knife! This looks amazing. I can’t wait to try it. My mouth was literally watering as I was reading the recipe! Such great fall flavors. I hope you love it Patricia! I hope you love it just as much! Pretty good! I made this last night because my 4 year old has wanted to try salad. First, I’m not sure we used the same portions for the ingredients. I eyeballed the cheese, which is never as accurate, and think I under dressed the first time around. Also, the 1 year old kinda stole most of the apples. And then the cheese. And then she generously donated her lettuce to my plate. Okay, so maybe I should remake the salad before I comment, but it was pretty good last night and it can only get better with all the toppings. Really I just want to thank you for a fun, kid friendly recipe. Excited to try this!! I love Panera’s Fuji Apple Chicken Salad so I’m hoping this is similar. Loved it! Used cranapple juice and cheddar in place of goat. So yummy! So delicious! Can’t wait to eat the leftovers for lunch tomorrow! This would be perfect with your slow-cooker shredded chicken tossed in it!